Fox News contributor Sara Carter reports Justice Department Inspector General Michael Horowitz will wrap up his investigation into the handling of the FBI’s Hillary Clinton email investigation next month. Carter reveals the probe includes interviews with former top and current FBI and Justice Department officials. A day after the New York Times reported FBI Director Christopher Wray confronted McCabe over unspecified findings in Horowitz’s report, the Washington Post reveals the embattled bureau official is being probed over his role in examining emails found on former Rep. Anthony Weiner’s laptop. Last June, former lawmaker Jason Chaffetz reported Horowitz was investigating Lynch’s role in the Clinton email probe. The Justice Department’s office of inspector general is said to be probing former Attorney General Loretta Lynch’s role in the FBI’s investigation of Hillary Clinton’s handling of emails as Secretary of State. 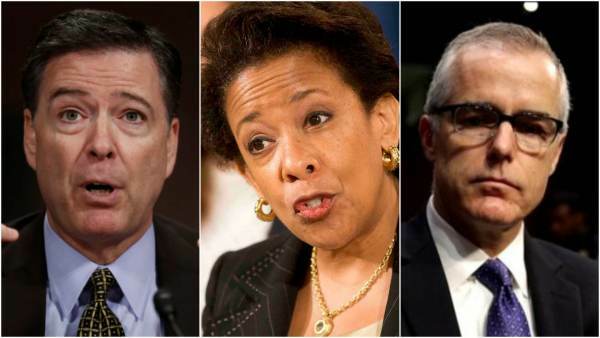 The DoJ watchdog’s probe was revealed Saturday by House oversight committee chairman Jason Chaffetz in an interview with Fox & Friends, and joins a Senate Judiciary Committee inquiry into Lynch.